Our unique On-Wall Far Infrared heating system is the perfect solution for home heating! This new ceramic system is more efficient and advanced than any other heater on the market because of the specific far infrared wavelength frequency generated by our ceramic plates. 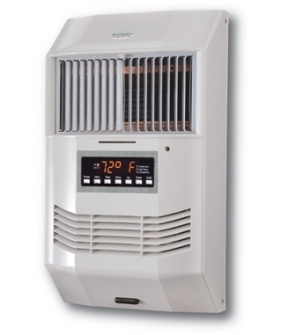 It has dual HI/LO power settings and includes a 3-Stage Air Purifier that can run independent of the heater. Simply mount on any wall near or over an existing electrical outlet and plug it in. A mounting bracket is included for hanging on the wall. Can be mounted near or over an existing outlet. Power cord plugs into a 115V grounded electrical outlet or the heater can also be hard wired. Wall installation of this unit takes about 5 minutes to complete and requires a portable drill and two (2) screws. With an additional 2 screws (optional) the unit can be secured to the wall permanently if desired. The BIO-1500 OWA is designed to be mounted to any wall between 12 to 24 inches off the floor, however, it can be mounted higher if desired. It should be located within 7 feet of a standard grounded 120 volt wall receptacle. internal cavity. This ‘look’ without the cord showing resembles a professionally wired installation job. The unit comes with an alternate control panel lens without buttons to prevent child tampering. The remote supplied with the unit is then used to monitor and control the functions of the heater. BIOSMART TECHNOLOGIES (BT) warrants this product, to the original purchaser or gift recipient, to be free from defects in workmanship and materials under normal use and service, for a period of one year from the date of purchase. BT further warrants the infrared heating elements and fan motors, to the original purchaser or gift recipient, for a period of four additional years from the date of purchase. Shipping: BT or its Dealer shall bear the cost of return shipping and repair, or replacement if, during the first 90 days, there is a defect in workmanship or materials. Thereafter customer shall bear the cost of return shipping to BT or repair the unit in home per the above terms for labor reimbursement. If BT receives the unit for repair, defective parts, including all labor, will be provided by BT for a period of one full year from the date of purchase. Note: Some jurisdictions do not allow the exclusion of limitation of incidental or consequential damages, so the above limitation or exclusion may not apply to you. The Company will not be responsible for the damages or losses, direct or indirect, caused by misuse, abuse, accident, negligence, conditions of transportation or storage, or failure to follow instructions. The Company will not be responsible for any statements that are made or published, written or oral, that are inconsistent with this written warranty, or which are misleading or inconsistent with the facts as published in the literature or specifications by the Company. Contact the Dealer you purchased your equipment from for additional instruction. Provide proof of purchase, if requested, in the form of a Bill of Sale or receipted invoice to show evidence that the unit is within the warranty period. See your Owner’s Manual for Troubleshooting your BioSmart® Far-Infrared On-Wall Heater, or call our customer service department at 1-800-595-9605. Due to it’s modular design, all parts are easily replaceable.